The day I saw Pirates of Caribbean, I wanted to be a pirate, rolling on the ships, looting other ships. Pretty dangerous dream for the real world but great for gamers. So this month is dedicated to the Pirates. 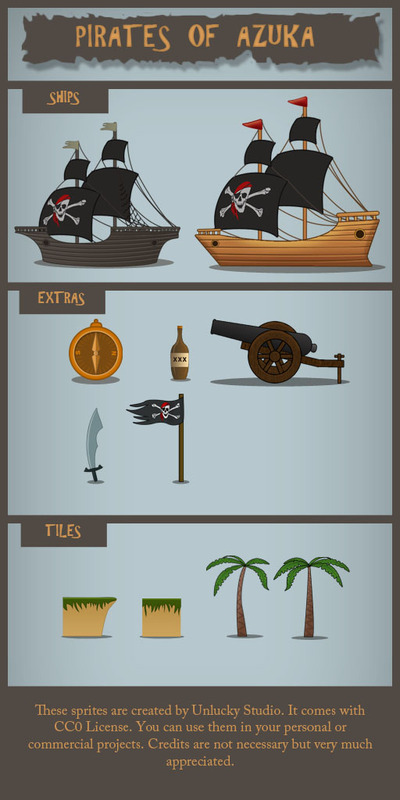 If you are working on any pirate theme game then you will like them. I had a lot of plans for this pack but things did not work out as I expected. I will surely update this pack in the near future. Source files and this assets pack was already mailed to the subscriber three days ago. I will be a creating an exclusive game assets pack for them soon. Sign up to the newsletter if you don’t want to miss this opportunity. Licence information: All the artwork are free for commercial use with a CC0 – Public domain license. No credit required but they are always appreciated. If you use them in any projects. Feel free to comment or email me. I would love to see them in a real game. I can also feature your game on this website. But the game should have at least one level or it can be a demo, if you are creating a commercial game. Game Art Quest: Become Better Game Artist with Krita Got Successfully Funded!! !